2019 is in full swing, and we have lots of new Toyota models in stock and ready to be driven off the lot! 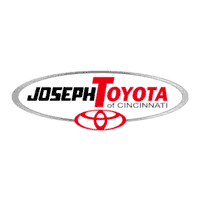 Though our inventory is constantly changing as cars are sold and we get new stock, here’s a look at some of the new Toyotas you can check out at Joseph Toyota in Cincinnati, OH. The Corolla is a feature on roads everywhere around America. This compact car is reliable, fun, and packed with fun features. It’s perfect for someone who wants a smaller car that can squeeze into tight parking spots and gets phenomenal fuel efficiency in the city and on the highway. For its low price point, this car also offers loads of standard safety features and plenty of room for passengers. This new Toyota is also available in a hatchback version for 2019, which offers even more cargo room! You’ll be able to seat up to 5 people in the 2019 Toyota Corolla with ease, so you don’t have to worry about not having enough room to bring your friends along. And since the Corolla gets superb gas mileage (27 – 32 MPG city and 35 – 42 MPG highway) you’re going to want to bring your friends on that road trip you’ve been planning for years! The Corolla comes with FWD and the 1.8-liter four-cylinder engine makes 132 horsepower in the base model. This is plenty for day-to-day travel and commuting. If you want a little more power, go with the LE Eco edition which produces 140 horsepower or the 2.0-liter four-cylinder engine which will give you 168 horsepower. The 2019 Toyota Camry is ranked the #1 Midsize Car by U.S. News and World Report, an unbiased company offering in-depth industry analysis and reviews. It’s no wonder that the Camry scores extremely high in just about every category year after year. It has excellent safety ratings, scoring 5-stars overall for safety by the NHTSA and even getting 10.0 out of 10.0 by the U.S. News and World Report. This new Toyota is easy to drive, has plenty of power for a midsize car, and gets good gas mileage. You can fit up to 5 people comfortably in the Camry and keep them entertained with Toyota’s user-friendly infotainment system and Apple CarPlay which comes standard with the 2019 version. You’ll get between 22 – 29 miles per gallon with the Camry in the city and 32 – 41 miles per gallon when driving on the highway. This means that you can drive around without putting a hole in your wallet! The Camry also provides plenty of power, offering between 203- 301 horsepower. Overall, the 2019 Toyota Camry is considered by most to be a great car. It’s fuel-efficient, has energetic engines to choose from, and rides comfortably while handling well. You’ll also find lots of standard driver assistance features in the Camry, which is one of the reasons it scores among the top of its class for safety. Compact SUVs are becoming the new family vehicle and taking over the market. Competitive SUVs like the 2019 Toyota RAV4 have to offer loads of capability, features, and safety ratings. 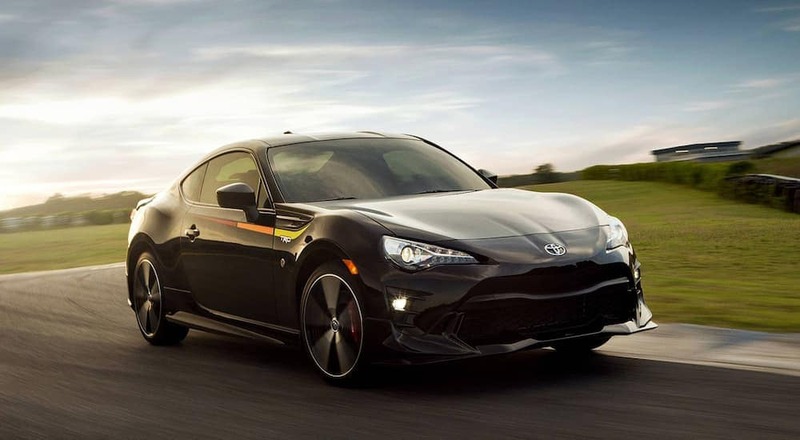 To make it stand out ahead of the pack, Toyota has made the 2019 version of this new Toyota even more powerful and more fuel-efficient than ever. The exterior of the RAV4 has also become even more sleek and eye-catching. This SUV is definitely among the top in compact SUVs on the market. 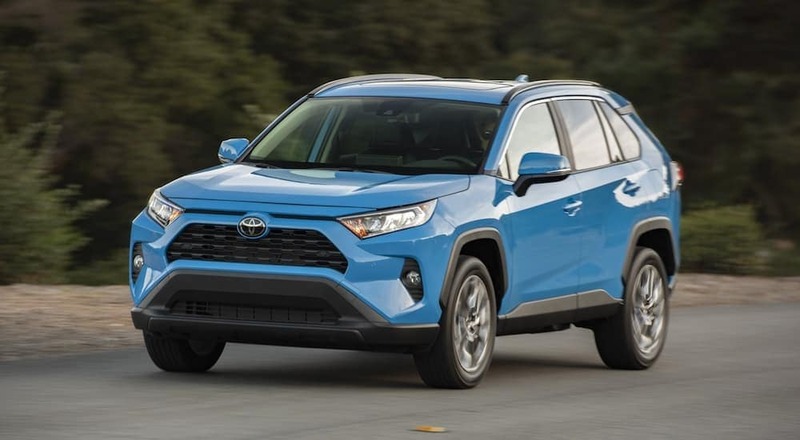 The 2019 Toyota RAV 4 can comfortably seat up to 5 adults, comes in your choice of FWD (standard) or AWD. You can expect to get up to 26 MPG in the city and 30 MPG on the highway with this new Toyota. The RAV4 features a 203-horsepower four-cylinder engine which provides ample acceleration and power whether you’re driving around town or on the highway. You’ll find lots of cargo space in the RAV4, so no matter whether you’re hauling groceries home or your ski equipment to the mountain for the weekend, you’ll be sure to be able to fit everything in. The 2019 RAV4 also comes with many standard driver assistance features. At this time, the 2019 Toyota RAV4 hasn’t received a safety rating from the NHTSA, but we’re eagerly anticipating similar results as many other new Toyotas. If you’re looking for a mid-size SUV that will keep your busy family going in safety and style, the 2019 Toyota Highlander might be the perfect vehicle for you! With an overall five-out-of-five-star safety rating by The National Highway Traffic Safety Administration, you can be confident that you’ll get where you’re going in one piece. The 2019 Toyota Highlander has seating for 7 – 8 people, so you can bring the whole gang, and then some! Even though this mid-size SUV is quite large and powerful, providing between 185 and 306 horsepower, the Highlander still gets great gas mileage. You can expect between 19 – 30 MPG in the city and 24 – 28 MPG on the highway depending on whether you upgrade for AWD and a more powerful engine. There is an optional V6 engine which is both robust and fuel-efficient and will add a little extra oomph to your daily drive. Inside this new Toyota, you’ll find a comfortable and quiet cabin made with stylish and first-rate materials. You’ll never lack that feeling of luxury, even if you’re hauling the kids back and forth from school and extracurriculars! There are also lots of available and standard safety features in the 2019 Toyota Highlander to keep you and your passengers safe. In fact, the Highlander even scored a 9.2 on safety by U.S. News and World Report. If you are in the market for a reliable mid-size truck, the 2019 Toyota Tacoma should be high on your list. It’s been ranked as the #2 compact pickup truck by U.S. News and World Report and is one of the best off-roaders in its class. You’ll also be impressed with its payload and towing capacity which exceed many in its class. The Tacoma can haul up to 1,620 pounds and tow up to 6,800 pounds. Not bad, if we do say so ourselves! This new Toyota sits between 4 – 5 people depending on the cab type you opt for. It comes standard with a 2.7-Liter DOHC 16-Valve 4-Cylinder engine, but can be upgraded with a 3.5-Liter V6 for extra power. Depending on the engine you choose and whether you upgrade for a 4WD drivetrain, you can get up to 17 – 20 MPG in the city and 20 – 24 MPG on the highway with the 2019 Toyota Tacoma. This truck also provides between 159 – 278 horsepower depending on what’s equipped. The NHTSA gave the Tacoma an overall four-out-of-five-stars safety rating and 5-stars for side crash tests. Standard safety features in the 2019 Toyota Tacoma include a rearview camera and Toyota’s Safety Sense suite. This suite features automatic high beams, a pre-collision warning and braking system, pedestrian detection, lane departure warning, and adaptive cruise control. If you want even more safety features than that, rear parking sensors and blind spot monitoring with rear cross traffic alert are available in this new Toyota. 0 comment(s) so far on Check Out Our New Toyota Inventory!